Being on the road during the last week has kept me away from blogging. Also, I had problems accessing the internet / finding an open WLAN hotspot nearby. Even thought about using this really awesome BackTrack Linux LiveCD which helps to gain access onto locked WEP networks. However, I didn’t try it becos a) couldn’t initialise the wlan module on my notebook and b) didn’t have the time to configure it. I’d love to have this as a virtual machine on my system, though. Maybe there’s an easier way to get this distribution as a fully loaded appliance for the vmware player. Speaking about accessibility, I am currently trying to prepare my notebook/system for offline use. That is, installing offline tools that will help me get going where there is no or only limited Internet access. After all, most Web 2.0 utilities are nice but they lack one simple logic: they only work online and/or require a server somewhere. It would be nice to have this technology implemented in a simple operating system that works much more like a server. Instead of having a fixed operating system installed on the HDD with various additional programms, it would be nice to have it run on a virtual machine – and the installed operating system could be limited down to very basic needs / just provide the GUI. Also, I think this will be part of the future – more and more systems being less dependent on the actual hardware, but instead swapable like USB memory sticks. Imagine this scenario where you’d take your computer with you on a simple USB stick (it would run on such a memory stick) and static data could be added/mounted additionally. Actually, my dear friend Onnomoja recently went to Southern Sudan and complained about the lack of internet “out there in the desert”. Of course, you’d think, of course there’s no internet out there. But then, there are a lot of things you’d like to check out while on the road somewhere and – being a kid of these modern times – we have meanwhile become used to just google it or check it out on Wikipedia and other compiled resources. Hence, what is needed is a way to either sleep for the next 50 years and wait until the earth is fully connected, or else check for helpful offline alternatives that are just as accessible as the internet is with it’s various resources. The following two tools seem to be nice for offline use and I’d be happy to read your personal suggestions in the comment section to see what kind of tools also do the job offline when there’s no internet available. Blogdesk is a free-of-charge (Windows) offline editor for your favourite blog systems. Available in different languages, it comes at a size of ~ 4 MB (WinXP, 2k, 9x) and really helps to prepare entries when there is only a limited timeslot for internet access. Compile your entries offline and upload them when the connection is stable. Modem users will really like this, I think. 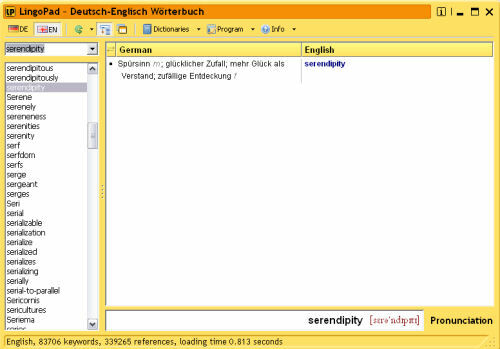 I just installed this free multilingual dictionary on my system and all I can say is: WOW! This is exactly the kind of programme I have been looking for – a free, stable little tool that provides access to various offline dictionaries. Most alternatives are commercial, somewhat expensive and require lots of system resources. What I wanted is a little tool that instantly loads without much hassle and is as up-to-date as possible. You know, here in Germany there are two great German/English dictionaries availble online: LEO and Beolingus – both websites run by universities (Technical Universities of Munich and Chemnitz) and, unfortunately, the LEO database used for their online dictionary isn’t available for download yet. These websites are great, as they provide many many entries for each word – not just simple 1:1 translations. But then, again, only online. LingoPad tries to change that, as they are using parts of the TU Chemnitz dictionary database. Great! And of course, there are many other free tools available for offline use. Just think of email clients or small editors that run directly from the USB memory stick. I wonder why ppl still go online, write emails and actually pay for the time online. Instead, they could rather write/edit their stuff offline and then use tools on USB sticks to manage their online duties. Just think of various cybercafés in Kenya and the many USB memory sticks that are currently on offer in Nairobi. Wouldn’t it be nice to have an offline package of useful tools for those users that own no other hardware but a simple USB stick where they store their data? This would also help to curb the issue of accessing certain webmail providers while in Kenya – some of those pages take ages to load due to various reasons and instead of paying for online time (trying to open these pages and THEN editing their emails etc. ), they would only pay for the actual time it takes to e.g. send & receive emails by using an email client. Only a few people, I think, are aware of these possibilities. Ama? Wouldn’t it be nice to have an offline package of useful tools for those users that own no other hardware but a simple USB stick where they store their data? Why not prepare USB Sticks completely whith cool offline software? Maybe even offer wizards to konfigure everything (email, blogdesk) on them? Webaccess on the other hand is available quite everywhere , its just a question of the cost. Here is a VSAT overview I just found. I really appreciated the LEO dictionary, because of the allocation in technical terms (engineering, biology etc.) The accessibility via internet only is a big drawback. Therefore I am more than happy about your detection. But please let me know, whether this offline dictionary has also many technical terms. Another suggestion for you, try HTTrack, it downloads entire websites to your pc for you to browse locally at your leisure. I so much appreciate your geeky posts. I’m 50 and really computer stuff is still such a mystery to me. But I correspond with a friend in Iganga, Uganda who has through various ways gotten exposed to computers and the Internet. Some of what we talk about are exactly the kinds of approaches you mention here. The learning curve seems much steeper when access to the Internet is so scarce and costly. Your posts teach me and also give me ideas of how to assist my friend. LOL he won a prize of a memory stick for writing an essay on ICT in Africa. Unfortunately the prize was never delivered. One day I hope he’ll be able to get a memory stick. I agree that they are one really good way to make the limited access to the Internet much more useful. Thx for the website copier, nice. @CG: there are complete USB memory sticks for sale – already! – with preconfigured releases of Thunderbird & Co. And mobile, stand-alone versions of various progs that directly run from the stick are available….only…no one knows that.